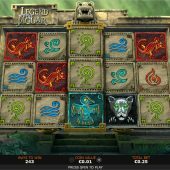 Legend of The Jaguar slot takes us to another popular slot theme destination, the jungles of South America already visited by Thunderkick with Jaguar Temple and Novomatic with the lamentable Jaguar Moon. Speaking of temples, that's what we see behind the reels and we have a female explorer loitering by the right of the stone grid ready to celebrate any wins which will spin in to the predictable tune of Inca pipe music. Perhaps she's the wife of the explorer in Book of Ra but doesn't smile as much, in fact not at all - maybe relieving us of our bankroll will cheer her up a bit! There is the unusual combination here of a 5x3 grid with 243-ways to win and 15 individual tiles forming the cascading reels, as in Gonzo's Quest. In fact before we see the 5-of-a-kind pays it's worth mentioning that as with Gonzo there is a 1-2-3-5x increasing multiplier in play for successive cascade wins, displayed in stone on the left. We pay 25 coins and get 100x bet for the very rare Jaguar, 12x for the Horse, 8x Lizard, 4x Quetzal Bird, 3x Fish with the low pays being formed by carvings representing Earth, Water, Wind and Fire paying either 2x or 1x. Wilds can appear anywhere and presumably pay the same as the top pay. Now if the Jaguar appears on reel 3 and there is no win or previous cascade i.e. it drops straight in then it will become a sticky expanded Wild and the reels respin until either a win appears or free games are triggered. Given that scatters only appear on reels 1, 3 and 5 I can only assume this special Wild will count as the reel 3 scatter! The free games bonus is rather unusual as when triggered you will have the choice of one of three types by selecting it's specific Idol. That's not particularly odd in itself, but the more smashes it takes to break the Idol the more free games are given. Double Multiplier Games - 10 to 15 spins with the cascade multiplier doubled to 2, 4, 6 and 10x. No retrigger and the highest volatility choice. Stacked Wild Games - 6 to 10 spins with one Wild reel every time. Medium volatility and no retrigger. Winning Free Games - 8 to 12 spins where the spin counter only decreases when you win. Lowest volatility and can retrigger. 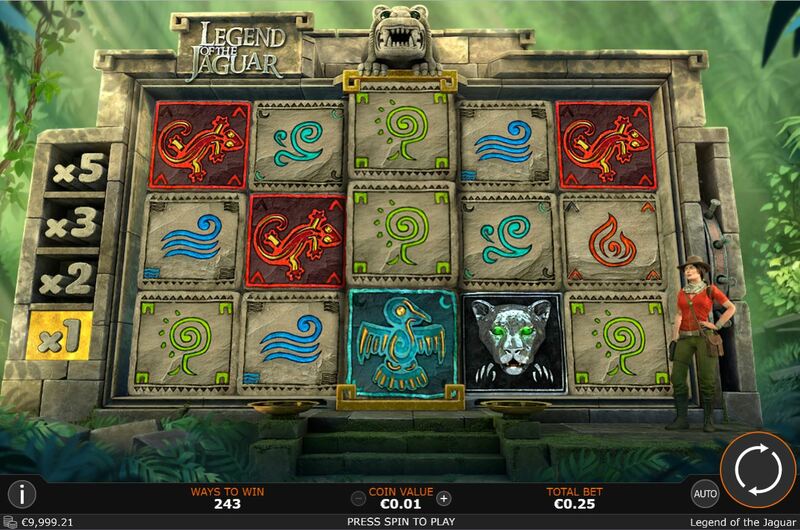 Legend Of The Jaguar slot isn't a bad combination of cascade and multiways with a good 96.00% RTP, none of which in this case is shaved off for a progressive jackpot. The game may be a little slow for some and the bonus is hard to trigger but is usually well worth it with some decent totals achievable. I'm not so sure about the Jaguar respins as they seldom pay more than a few times bet and are frustrating to watch but overall the graphics and appearance are good aside from the silly female explorer who raises her arm and squeals on every single win, making you wish a poisoned dart would come out of the bushes and sort her out once and for all. That said, darts or no darts I'll be keen to take another jungle trek to seek this Jaguar out once more..